New item in original packaging. 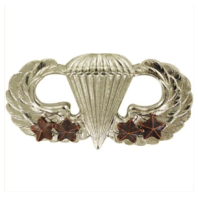 Army Badge Regulation size mirror finish Basic Combat parachute 4th award - individually priced. WIDTH 1-1/2" HEIGHT 13/16"